Ms. Steefel is an associate attorney whose practice focuses on criminal defense, including trial-level advocacy, direct appeals, state post-conviction litigation, and federal habeas. Ms. Steefel graduated with the top GPA in her class at the University of Denver Sturm College of Law, which she attended on a full-ride, public-interest scholarship as a Chancellor Scholar. She served as the Symposium Editor for the Denver Law Review, where she organized a national conference, “Justice Reinvestment: The Solution to Mass Incarceration?” During law school, she worked with professors on litigation in the U.S. Court of Appeals for the Tenth Circuit involving federal constitutional claims. She also interned at many civil-rights and criminal-defense organizations, focusing on prison conditions, police reform, fair housing, disability rights, juvenile criminal defense, and movement lawyering. 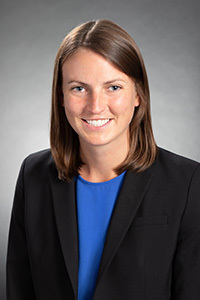 Throughout law school, Ms. Steefel received many awards, including the Sturm College of Law Student Leadership Award and Outstanding Graduating Student (selected by her peers). She was also a three-time recipient of the award for Most Innovative Program for designing and implementing the projects Analyzing the Law through a Racial Justice Lens and the Pledge for the Public Good. The American Bar Association selected Ms. Steefel as one of only 25 individuals nationwide to be awarded National Jurist: 2017 Law Student of the Year. Ms. Steefel served as a law clerk for the Honorable Justice William Hood, III, on the Colorado Supreme Court. Between college and law school, Ms. Steefel spent a year living in Santiago, Chile, where she taught English and worked at a newspaper. She is fluent in Spanish. Freeman, Alexi & Steefel, Katherine, Uniting the Head, Hands, and Heart: How Specialty Externships Can Combat Public Interest Drift, 25:2 Clinical L. Rev. 325 (2019). Freeman, Alexi & Steefel, Katherine, The Pledge for the Public Good: A Student-Led Initiative to Incorporate Morality and Justice in Every Classroom, 22 Wash. & Lee J. C.R. & Soc. Just. 49 (2016). Ms. Steefel is a mentor in the Law School . . . Yes We Can program. She has volunteered with Padres & Jóvenes Unidos. She recently served as co-chair of Pro Bono Week for the Denver Bar Association’s Access to Justice Committee.